Managed to get my hands on the last two remaining ‘ready to eat now’ avocados in the supermarket. All the others were hard and seemed as though they would have taken a month of Sundays to ripen. They were perfect. Sadly the dog broke the pestle and mortar recently in his haste to get to the bread rolls when I was out. Or maybe it was because he wanted to lick out the dressing in the mortar. 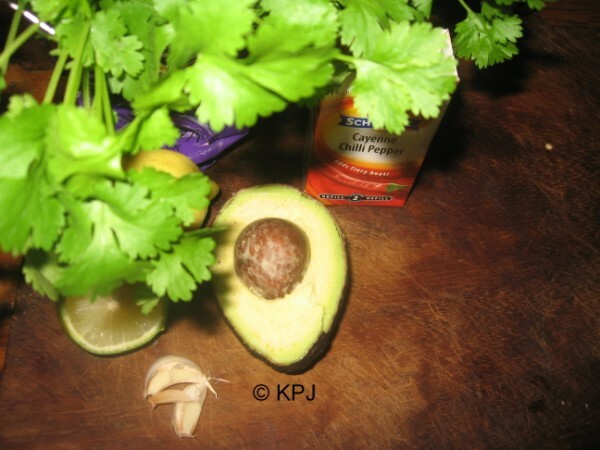 Either way, I am pestle and mortarless.So the avocados were mashed up with a fork, with a couple of cloves of garlic, both lemon and lime juice, and cilantro/coriander. I left some chunky pieces of avocado in for texture really. I would have added a few grains of salt – if I’d had a pestle and mortar. I sprinkled a small amount of cayenne on the finished salsa.In the past I’ve added tomato, and/or onion, but I thought these two avocados were too perfect to adulterate. And like gazpacho, where I don’t bother adding chopped tomatoes, cucumber or onion, sometimes less is more. My niece adds Greek Yoghurt to her guacamole. Gives it a creamier texture. Nice touch. They sure are. Wish I can send you avo’s when your tree bear fruit next year. Around March/April. And some of them are huge! How do you send Avo’s by post anyways? Or how do you send them? LOL! PS I normally use a fork for guac though, see forthcoming picture on next post later this week.